The World Is Changing! This is what I think of It! I’ve watched from a distance as the world around us begins to implode. I have to wonder if the days that we are living in now are worse than the days when we were children. Is it because the exchange of information is more rapid than it was 25 years ago? Are we no longer in an age of innocence? Or have we just matured? Is this what a nation looks like after nearly 250 of democracy and freedom? I ponder these questions (and others) as I steal away from family, friends, and media. I wonder about tolerance. I think about what freedom really means. Democracy is starting to look more like hypocrisy as we defend our varying degrees of freedom. We have freedoms of speech as long as you watch what YOU say. YOU being the key term here. Those making the rules and those forced to follow the rules tend to be very different. “Do as I say, not as I do” mentalities are becoming the catalyst for frustration. “Just do it!” is not just the mantra for prominent athletes; but the cry from the authorities. Like the frustrated parent or the burnt-out school teacher, the need to gain a result (just for the sake of getting it done) has society unraveling. Why? Because after years of doing things a certain way with sub-par results, we’ve become intolerant of complacency. The conservatives cry “us back to a time when things were better.” Meanwhile those who’ve struggled long enough scream for justice (and not JUST US). The neo-rebellion is upon us. These are not fighting words though. Hold on to hope. Be certain that there are powers at play here that far outreach our own ability. Be inspired that change is coming. We have become intolerant. We see changes in the way we…learn and the way we…teach; the ways we gather information and the means we use to disseminate the selective bits of bias and propaganda. Options? As long as those options don’t slow the machine. Now we have default settings on everything. From our cheeseburger fixings to the electronic seat positions on our $70K Cadillac. Problem is that we are so used to having options, we’ve become entitled. 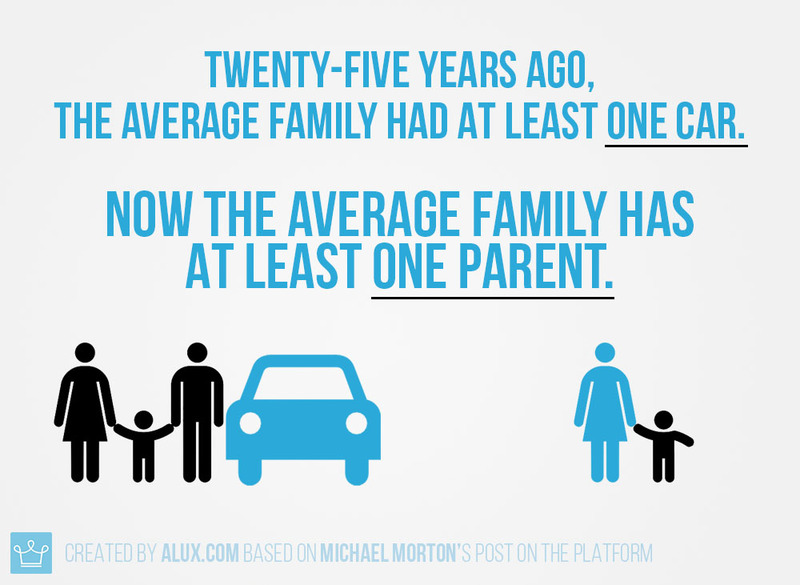 Twenty-five years ago, the average family had at least one car. Now the average family has at least one parent. My colleague shared his theory that many of our students have a “no-parent home.” He explained that the single-parent families rely on other members of the village (i.e. grandma, auntie, or neighbor) to raise the children while the parent struggles to hold down a day-job AND the part-time night job. The adults “watching” the children are setting the kids off in a corner in front of a television or with a handheld device to entertain them until mom/dad gets home. Homework doesn’t get checked. The PG-13 ratings on unlimited programs the kids are absorbing gets absolutely no “Parental Guidance” and the kids are raising themselves. They are not favoring inspirational videos on YouTube nor Modern Marvels on the History Channel. A steady diet of Disney, Nickelodeon, and Cartoon Network holds nothing to the unlimited info-tainment guzzled by our youth. The degree of care for your kid is diminished by the amount that she cares for her own kid. The point? What are we doing to teach tolerance? Those children between the Generation X’s and the Millennials have endured a immeasurable disregard for what is important. Those children, OUR CHILDREN, have invented a new set of priorities. 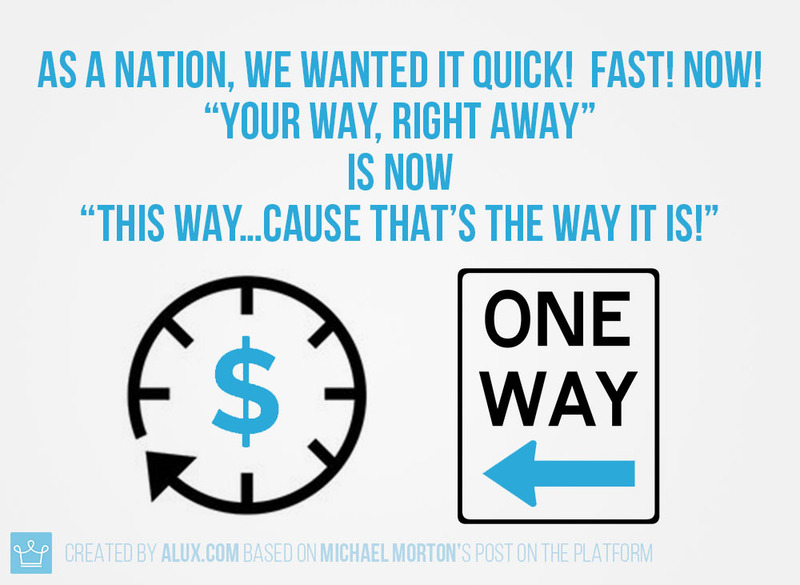 Our own lust for immediate gratification only models how “dead-set” we are. We’re intolerant of waiting on change. We will not save. We will not plan. We want it now. “Mine is more important than yours!” And for those who’ve continued to wait through this era, the time for change was YESTERDAY! So there will be no more waiting. Some have had it already. They were born with it or they earned a great deal in a short amount of time. The worth has diminished. And we still want it. Yesterday’s greed mongers have either squandered the stolen wealth, retired, or died. The descendants of that wealth are scrambling to protect it; as they realize that the 99% that DON’T HAVE will certain develop a means to take it. And it’s happening. By riots destroy everything. There will be no resources left to rebuild. As more and more injustices are revealed through news media, social media, and recovered evidence in police brutality and political corruption, It has become clear. Society has run out of time. I hope that when all is destroyed and it’s time to rebuild, we will be more tolerant of each other. I hope that we will pay closer attention to what we’ve done. I hope new history books will be written and that the story will be accurate this time. I hope we will have learned enough to model better for our children. I pray we will rebuild together. Good post Michael! Thanks for sharing! It’s all true, tension is building up all around the world not just in the US! The world is changing fast and some sectors did not keep up with it!